Review: Sara Bareilles’ "Kaleidoscope Heart"
A follow-up to her 2007 debut Little Voice, Bareilles’ sophomore album capitalizes on the double-platinum success of her breakout single Love Song, by procuring a track listing stuffed with sugary piano-pop that’s mainstream enough for Taylor Swift fans but folky enough to still make its listeners feel indie. On her resume, Bareilles should really highlight the rare skill of making sounds that fit equally on boho-Brooklyn coffee stand soundtracks and on Top 40 radio bookended between Usher and Paramore. Remember that scene on the bleachers in Never Been Kissed when Jessica Alba says to Drew Barrymore “you’ve totally transitioned. Some people go through all of high school trying to transition and they never make it”? She of course is referring to Drew’s overnight transition from nerd to prom queen, but the bitchy popular girl does make a valid point (okay, so we’re not talking about high school here, but you get the metaphor). Bareilles’ zero-to-hero success is extremely rare in a time when fantastic musicians like Ingrid Michaelson, although widely recognized in their playing field, hardly ever swim across the river from the land of indie darlings to the land of chart-topping musicians … at least with their sound and integrity completely intact (see: Jewel’s “Intuition” phase). What I’m really trying to say is: Sara Bareilles is not Josie-Grosie anymore. 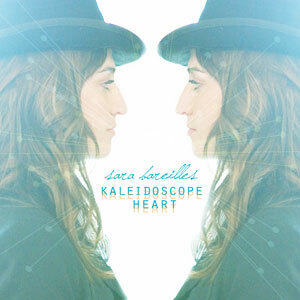 It is no coincidence that Kaleidoscope Heart was released in the fall. The album is all about turning new leaves, changing colors, and fresh beginnings. Bareilles’ sweet vocals and melodies channel the same feeling of excitement as that first sip of your inaugural pumpkin spice latte of the season. One can easily get lost in her music the same way you can get lost in the comfort of your favorite oversized sweater while planning your annual apple-picking expedition or trip to Six Flags’ Freight Fest. And just like a freshly lit fire, Bareilles’ songs flicker with sparks of intrigue and mysticism, rendering her audience incapable of feeling anything but warmth upon exposure. While she may have secured her place in the industry by crooning that she’s “not going to write you a love song,” Bareilles has made no such promise for round two of her musical offerings. Each and every twist of Kaleidscope Heart is a colorful love song, emblazed with fiery doses of the passion, longing, and pain that define human relationships. I’d be shocked if each song on this album wasn’t played at some point or another in the background of a borderline heart-wrenching/melodramatic moment during this season of Grey’s Anatomy. Tracks like “Uncharted” showcase Bareilles as a true triple threat (pianist, songwriter, and vocalist), while other songs harness her desire to branch out of her comfort zone and sprinkle her signature sound with influences from completely different genres (i.e. an undeniable country twang in “Gonna Get Over You” and a generous spoonful of jazz in “Not Alone”). Lyrically, the album is just as sharp and witty as Little Voice. Throw in the musical versatility Bareilles has infused her trademark ivory-pounding sound with, and this record proves that Bareilles, by taking risks that both expand and enhance her repertoire, is as daring as she is talented. At a recent concert of Bareilles’ I attended, she played an acoustic cover of Christina Aguilera’s “Genie In A Bottle,” joking about how she wanted to sing a song that inspired her to be the artist that she is today. With a jovial attitude like that in addition to her feel-good pop anthems, it’s easy to see why the masses are eating her up like she’s the last Red Velvet Cupcake at the end of the day at Magnolia Bakery. If Lillith Fair were a serial killer, then the 13 songs that compose Kaleidoscope Heart would be its massacred victims. It is easy to hear the songs on this album being the bouncy, upbeat relief you would need after pinching yourself to stay awake during Sarah McLachlan’s set or burning your bra during Ani Difranco’s. Bareilles’ compositions drip and ooze with Cranberries-esque 90’s female angst while simultaneously maintaining that overall slice of sunshine feeling she had already perfected on her first album. Little Voice gave the world a taste of a fresh new artist, but with Kaleidoscope Heart, Bareilles has played the notes that will ensure a long and fruitful career.